Featuring 200 cards. Shop for base sets. Click here for a detailed look at all of the set's various parallels. 2013-14 Panini Prizm Hockey is the first full NHL release for the popular chromium brand. 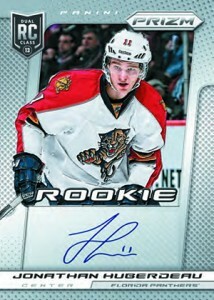 While it was previewed as a bonus pack insert in 2012-13 Panini Rookie Anthology Hockey, this is a more expansive take. The 2013-14 Panini Prizm Hockey base set is a moderate 300 cards. This presents something of a challenge for set builders but something that's still very much attainable. The set has a total of 100 rookie cards. As with other Prizm releases, much of the set's attention comes from the Refractor-like Prizm parallels. Hobby boxes have regular Rainbow Prizms along with new Orange Die-Cut (#/50), elusive Gold (#/10) and Finite Black (1/1) cards. These combine to fall two per box. Retail packs have their own exclusive Prizms: Green (all retail), Blue and Blue Pulsar (Wal-Mart), and Red and Red Pulsar (Target). 2013-14 Panini Prizm Hockey also has a pair of autographs in every hobby box. They land 1:2 retail boxes. The set has a massive signature checklist that clocks in at 200 cards and features three levels of autographs. Rookies play heavily into the autograph list. The release has basic inserts as well. Among them is Immortalized, which highlights players who have hoisted the Stanley Cup with a die-cut design. Hold onto your hobby wrappers, as there's a wrapper redemption for exclusive Purple Cracked Ice Rookies. 2013-14 RYAN MURRAY ULTIMATE DUAL JERSEY, CR AUTO, PRIZM & OPC RCs! COLUMBUS! Good: Vibrant design, simple set structure, fills void in hockey side of the hobby. Bad: Sticker autographs and chromium are not a good combination, would prefer more Prizms instead of many of the basic inserts, lack of 2013-14 rookies (unless there’s another set coming). The Bottom Line: Finally, hockey card collectors have a full-on chromium brand to collect again. There have been hints of them here and there, but nothing as dedicated to the look and feel as 2013-14 Panini Prizm Hockey. Overall, it’s a simple chase. It’s also very addicting. The lack of a true double-rookie class hurts the checklist, but with Panini pushing Prizm so strong, I’d be shocked if there isn’t something coming down the pipeline to fix that. 2013-14 Panini Prizm Hockey looks pretty much like every other Prizm set released this year in other sports, and that’s not a bad thing. Hockey has been largely void of a standalone chromium-style set for some time so the look feels fresh here. I’m a self-professed sucker for shiny things and these fit the bill here. The thick borders lend themselves well to the Prizm parallels. The photos are crisp and the colours pop. My biggest irk with the base cards are the pictures on the back. I don’t like doubling up. The second photo seems to be a lost art, likely tossed aside by card companies looking to trim costs. The real stars of this set are the Prizms, those super-shiny, don’t-call-them-Refractors parallels. Take all the exclusives into account and there’s pretty much a rainbow to chase. The concept isn’t new, but it works. It’s unfortunate that autographs are on stickers. No matter the set, stickers are chromium are not a good match as the sticker background and edges stand out a lot more on shiny surfaces. Other than the Prizms, my favorite design comes from the Immortalized inserts. Die-cut along one side in the shape of the Stanley Cup, the cards are not only a tribute to the players but the trophy itself. At 300 cards, it’s a decent size for set builders. It may not be the 600-card giant that O-Pee-Chee is, but Prizm is more on the premium side. The 200 base cards cover all the big names. And while the final 100 cards have the “Double RC Class” notation, it’s really only rookies from last season. Hopefully a second series is in the works for later in the season to cover the other half of the double-rookie crop. For many, the main chase is going to come in the form of the Prizm parallels. And while there are lots of them, hobby boxes aren’t actually that colorful. The majority come from retail packs and other exclusives. So as a whole, it’s fantastic. But if you’re buying hobby boxes, don’t expect a ton of variety color-wise. The autograph checklist is solid. There is a decent number of superstars to go with lesser stars. But is this product aimed at the autograph crowd? It doesn’t feel that way to me, so the lack of pop in this department is more excusable than it might be in some other products. Hobby boxes seem a little bit high, but not unreasonable. 2013-14 Panini Prizm Hockey lends itself well to starting with a box then picking away at the set a few packs here and a handful there. That said, the set builder in me feels as though there’s better value in some of the retail configurations. Because I’m more interested in the base set and going for a few Prizms here and there, the retail jumbo packs give me at least as many “shiny” cards as a hobby box. Yes, autographs seem tougher and there aren’t the low-numbered Prizms in retail. If that’s your thing, hobby is absolutely the way to go. I’m having a blast going after Prizm. While I like high-end products, I can’t afford them very often. This is a nice middle ground. The cards are all quality and have an upscale feel for the most part. At the same time, it’s reasonably priced. I like the colors, the checklist is strong for an early-season release and the photography is great. Most of all, it fills a void so there really not anything else like it in the hockey realm right now. 2013-14 SCOTT LAUGHTON PANINI GOLD PRIZM RC #273, SN 08 10 SSP RARE! I don’t understand the numbering system. I got a nice Mark Messier auto but on the back it says A-MM. That doesn’t correlate to anything listed above and there is no numbering on the card, ie. /50 or /100. Any insights as to what this actually numbered to? Coach Krusty � This was the checklist that came from Panini. I am not sure why the numbering on the back is different. They probably just switched from numbers to initials. The only autographs that are actually numbered are the parallels. If you look at the autograph checklist above, Messier is listed as an SSP, which means his base autographed cards are limited to 50 or less. Trey- That’s helpful. Thank you. Does anyone know why I pulled two cards numbered out of 30 but these are not listed here or on Beckett online? Gordo � They wouldn’t have been on the checklist Panini created. Which cards are they? I did a quick search on eBay and see some Cracked Ice cards from the Toronto Fall Expo. Since this was my son’s first year of ice hockey (learn to skate – ROOKIE SEASON, if you must) I thought it would be nice to ‘chase’ a first year set of hockey cards for him….of course since this is the first ‘full release’ of Panini Prizm Hockey – WHY NOT?!?!?! I’m really torn on my rating here because the lack of any memorabilia cards is a big minus, but really this is a decent looking set where rookies and autographs are the focus, and there are plenty of those to go around. I opened two boxes and got my 4 auto’s, all were rookie auto’s but not the bigger names unfortunately. I did pull a Leo Komarov Rookie Gold Parallel numbered 1/10 so here’s hoping Mr. Komarov has a very good carreer!. I also pulled an Orange Parallel Die-cut Martin Brodeur, and an Orange Parallel of the Zetterberg Pivotal Players insert set. Overall I pulled 16 of the various subset cards which was decent. 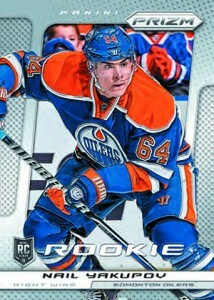 100 different Rookies is a really nice benefit of last year’s lock out and the cards look really nice. I picked up 2 of the Wal-Mart retail boxes, and while the blue pulsars are nice, every single card in the two boxes was slightly warped/curved. The hobby boxes did not have this problem and every card was in pretty much perfect condition. I’m not sure if it is a problem with just the cards at the 1 wal-mart location ( maybe stored wrong or something prior to being put on the shelf?) but it was rather annoying. Nice product. I bought some retail and some Walmart retail. How do you tell the difference between blue and blue pulsar? Dave � Pulsars have a patterned background as well. O.K. Now I am confused. What do you call a patterned background. have looked at all my blues and they all look to have the same type of background – on the edges of the card and in the pictures. I have notice that a couple of the cards have a darker blue border on the front. Seems that many sellers on eBay do not know the difference between BLUE and BLUE PULSAR. The BLUE cards have a real picture background. Most of the PULSARS I see have a distorted background that looks like the original background but made up of a series of coloured dots. ALL of the cards I pulled from the WALMART blasters have a regular picture background – not distorted. ALL of the cards I pulled from regular blasters also have the regular picture background. So, are the regular backgrounds actually BLUE PULSAR and the distorted backgrounds actually the BLUE? Dave � Both Blue and Blue Pulsars are from Walmart. If it’s the same as Target (which is Red and Red Pulsar instead), the Pulsars are in jumbo packs only. I know that’s where I got my Red Pulsars. I think I only got one Target blaster and only got regular Blue. So much misinformation out there. I guess if I read rather than looked at the pictures, I would know the answer to that. Anyways – thanks for your help. Prizm is my favorite Panini hockey set. the first auto I ever opened, I got a prizm prizms /20 alex ovechkin worth what I think is about $200. if anyone knows the real price, please reply. Anyone know the value of this card, I would like to sell it, since I am collector of Marian Gaborik only. Great affordable set with beautiful cards. I honestly think this is one of the best low to mid end hockey product of all time. I never got so excited about collecting a base set than with this product. Grab yourself a box when you still can, Panini will be well missed! 2 BOXES LOT. 2013 14 PANINI PRIZM NHL BOX FACT SEALD NATHAN RC ?